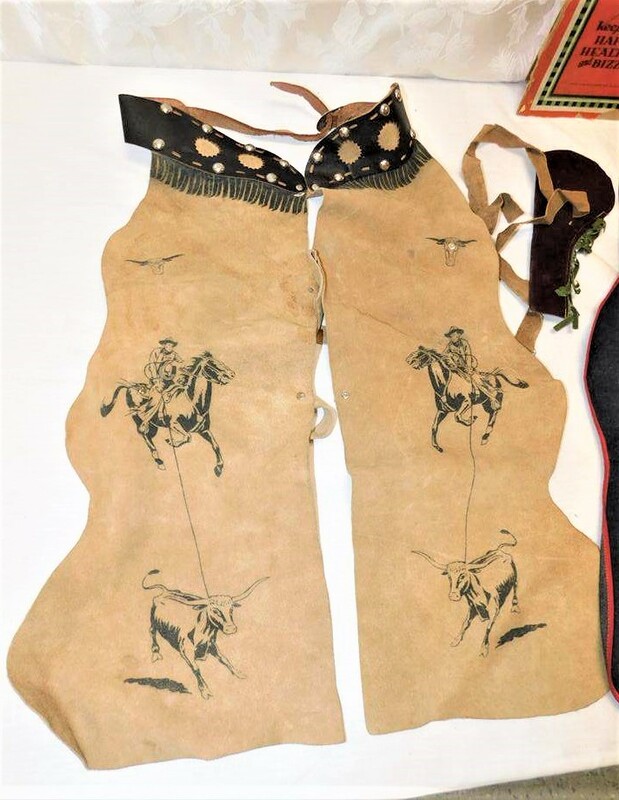 1) Suede chaps with leather cut-outs on belt Crystal clear prints of cattle rustlers on horseback lassooing longhorn steers on each leg Straps & chaps are intact with rivets showing iconic Keyston Bros. Mfrs of San Francisco buffaloes on each rivet head. Leather adjustable belt embossed with same Keyston buffalo icon. 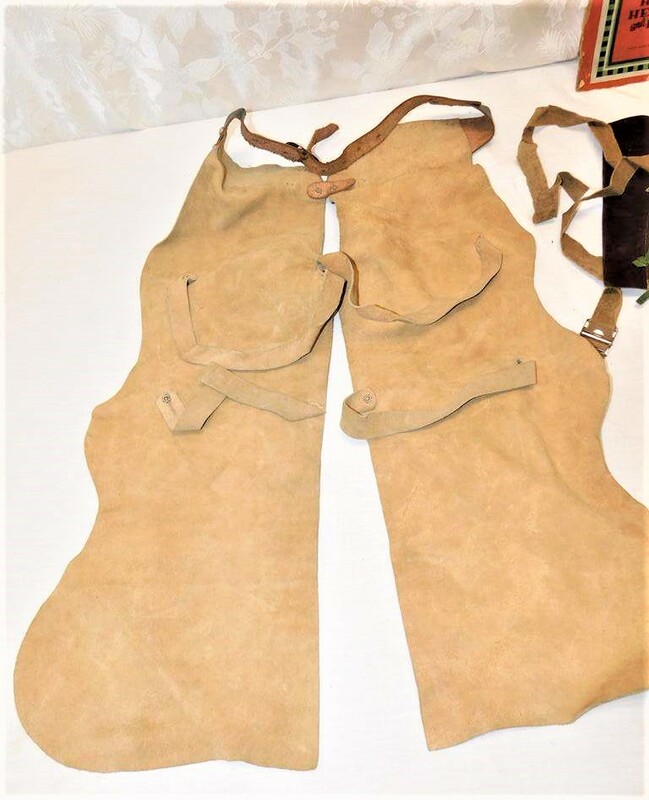 Includes suede holster with belt (no gun) & green fringe & blue suede stars attached by rivets. 2) Partial original box. Top of top cover with original art. No bottom or sides. 3) Second outfit is mainly denim. 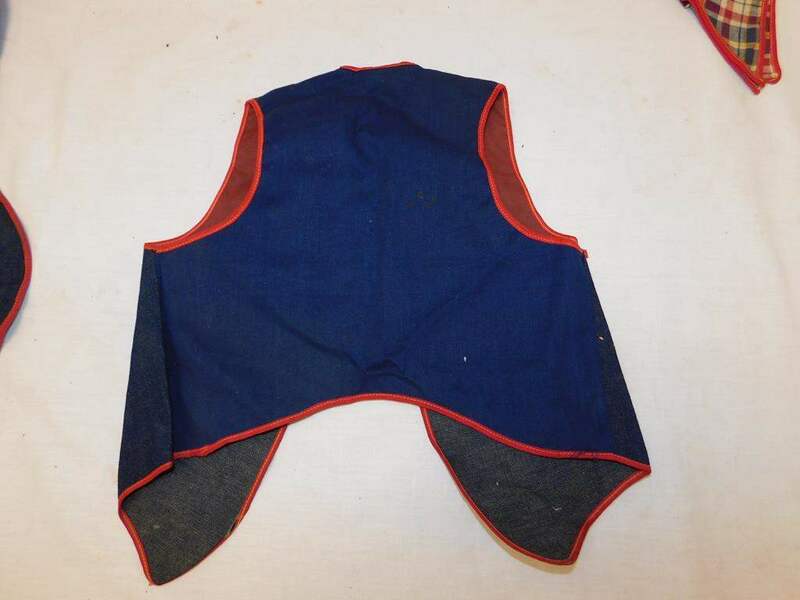 Matching pant-style bottoms, vest & neckerchief. Top of pants/chaps is red leather(?) 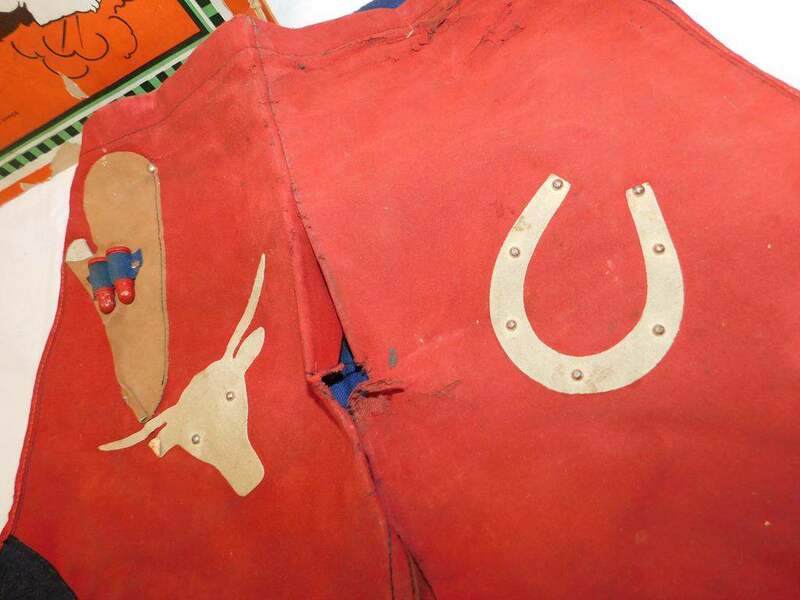 Holster, cattle head & horseshoe riveted to front of pants. Lined with red piping arounf edges. 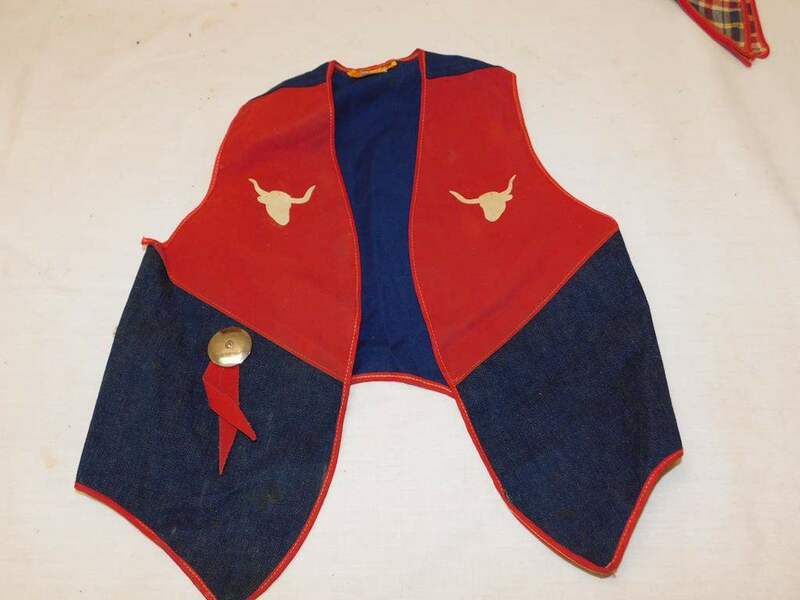 Denim & red vest with longhorn heads & concho badge on front. 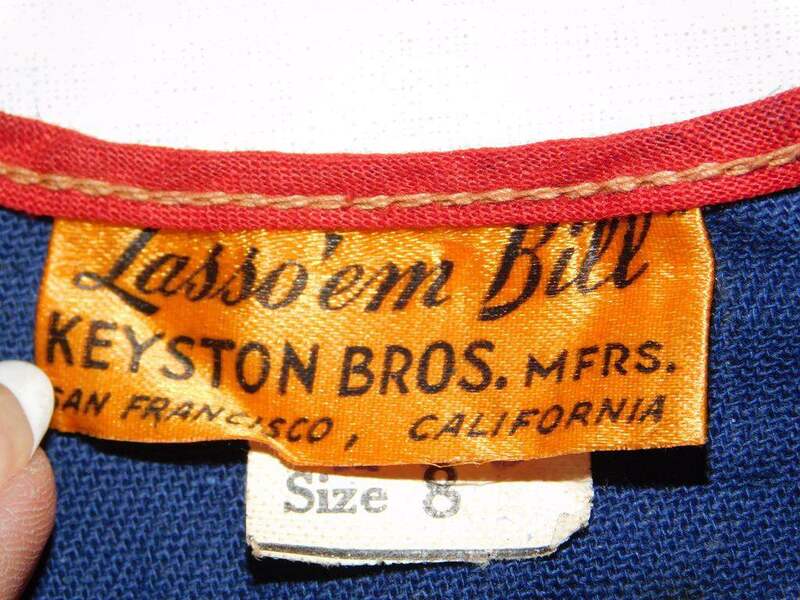 Gold label reads "Lasso 'Em Bill - Keystion Bros. Mfrs. - San Francisco, California" with careinstructions on reverse. 2nd white label says, "Lot 186, Size 8". 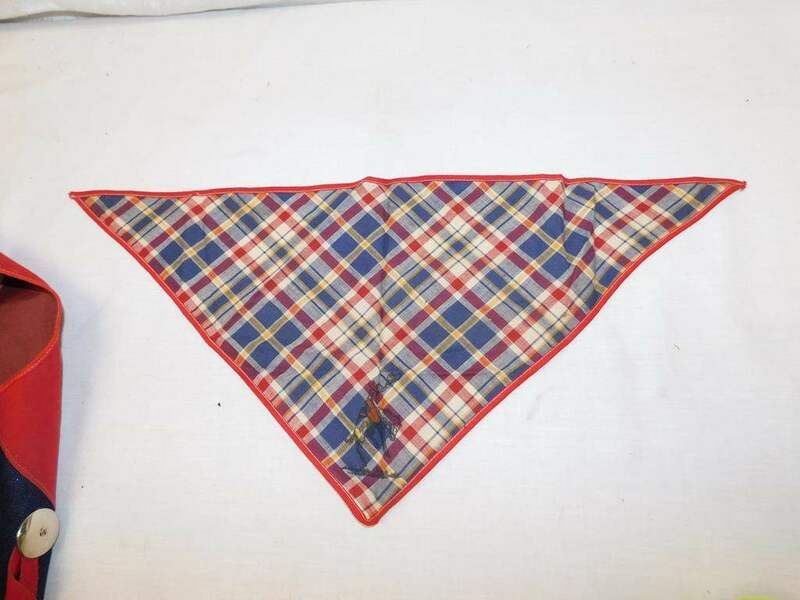 Triangular blue, red & white plaid kerchief has embossed blacklined cowboy ona bucking bronco at the tip. Picked up the outfit from an estate sale in Northern CA where there were numerous nautical, western & Native American items offered. Any ideas on value? Size 8 on denim outfit. Purchased from an estate sale of antique toy collector. Est Value: $150 - $230 US. Very collectable and great condition. I would highly recommend framing the Box Top to protect it from further damage ... adding a period cowboy hat and some guns would add a lot of value to the set. Thanks for sharing this cool piece of history .. please leave me some feedback on my valuation. Howdy! Didn't mean to ignore your comments. During my 3rd attempt to reply, my WiFi shut down completely, so I thought I'd give it another go today. Excellent suggestions about framing the box & adding pieces. Hadn't thought of doing either one. 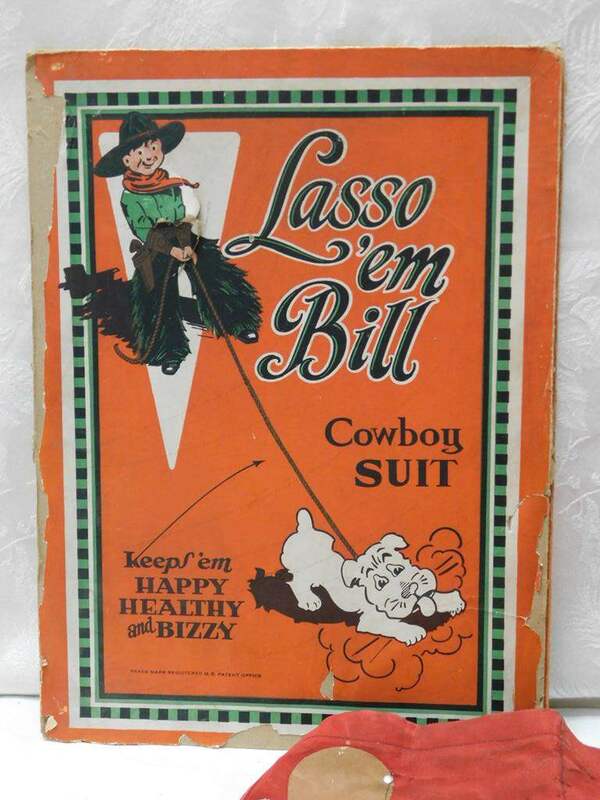 Just picked up a Lasso 'Em Bill boy's & girl's cowboy hats in near mint condition & am negotiating for a Lasso "Em Bill pistol in good condition (65% of original paint on the pistol grip). Had to buy a girl's denim chaps & vest set to get the hats. 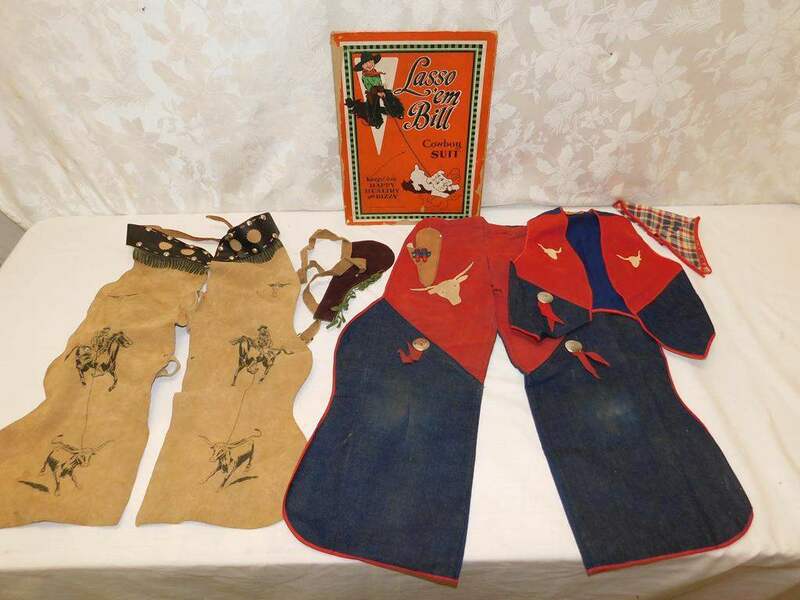 Any idea what the set including matching hats & pistol might be worth? Wow, this is like a treasure hunt! I surely do appreciate your input & knowledge. 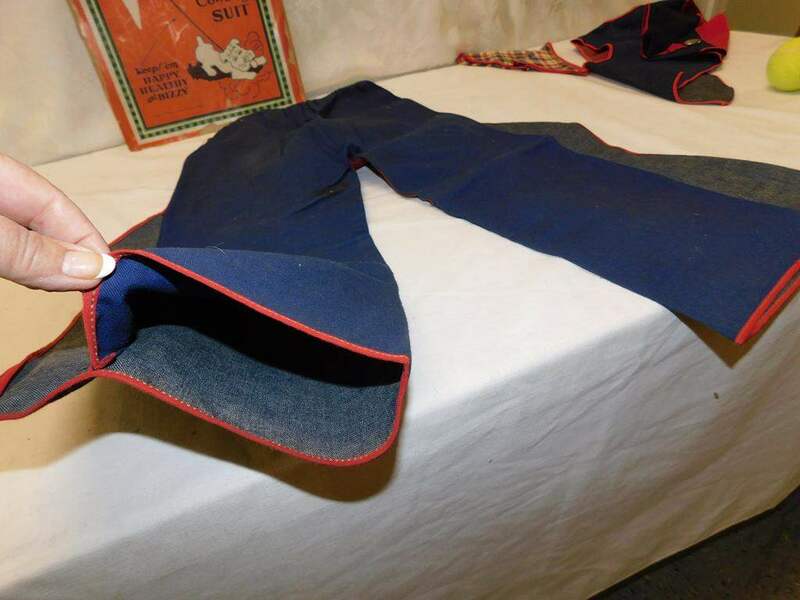 I've had a hard time finding info on these items because everything keeps pointing to their Western wear & fabrication work. I love the historical aspect of all of this. An inlaw of mine lived & worked nearby the Keyston SF location in the 1950's.